One rather quick and simple Zippo engraving. This is 1979 Dodge pick-up truck. This is the first time I tried to engrave chrome plated Zippo and is actually worked out rather well. But the engraving has to be inked, otherwise the cuts are yellow-ish and showing the base material (brass). Is it handmade? It looks really beautiful! Hey ! I love the outcome, beautiful! 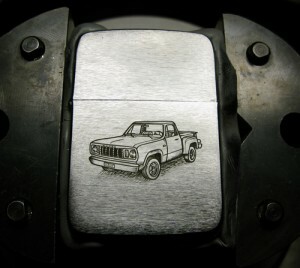 I’m looking to engrave a Zippo for my boyfriend, I think he once had the classical one and it’d be a line drawing of a snowboarder.. so overall a very similar look to yours. I thought it would need to be etched.. but you can’t etch steel or chrome, as you said it would be inked. I’ve never done engraving before, but there’s a workshop I could use. Could you tell me what I need for this, what ink you used? I use etching ink, that printers use to make prints from copper plates.